– we inside workout types dont have to show off our $200 sneakers to our gym buddies. – studies have shown the benefits of walking (or running) barefoot to be substantial for both strengthening foot and leg muscles and injury prevention. I figured that has to do with any workout, right? My feelings towards shoes have changed as I got more into home workouts – as new, impressionable P90x user I wore shoes (mainly the plyo workout) because I always do what I’m told, but when I started Insanity: Max 30, I went without and never missed them! I was out and about one day and saw some guy wearing those Vibram 5 finger shoes in the grocery store (not even Walmart! ), and while they may be ergonomic, they looked so odd to me I don’t know why anyone would want to wear them for a workout let alone, around town. There are many websites out there that discuss this topic. Pros and cons to wearing shoes during a workout, why it’s good for your feet etc. but I will let you make your own decision about wearing shoes or going barefoot during a workout. Do you prefer to workout with shoes or no shoes? Sometimes it feels like I am constantly working out even when I do finish my 30 minutes. Want to know how? Well, I’ve got an extra 22 pound toddler to lug around daily. From picking her up, setting her down (squats), running to grab her before she gets into something she’s not suppose to (quick reflexes and cardio). 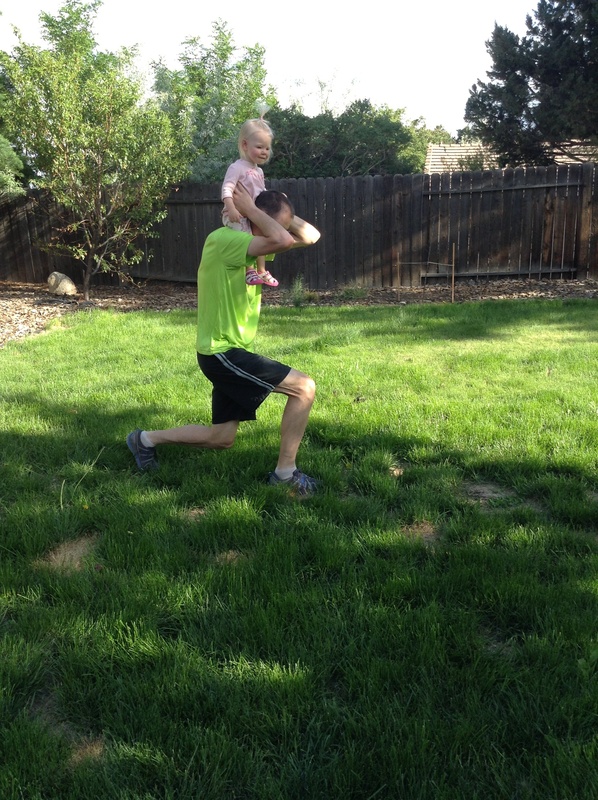 A few weeks ago, my husband decided to go out in the backyard and do some lunges. He decided to use our daughter for the extra weight. There will be days when I don’t want to workout and follow along on the tv, so instead of totally slacking, at least I have my 19 month old to use…no excuses right? -The scramble-jump up from a sitting position, dodge around blocks, over toys and catch the toddler before she empties a kitchen cupboard. -The squirm weight-carrying a squirming, usually screaming toddler to a bath, bedtime or other undesirable activity. Think “shake weight” results without looking like you are doing unmentionable things! Be sure to engage your core and feel the burn in biceps, core and ear drums! -Lunges-a baby adds a perfect amount of resistance for lunges when picking her up off the floor. Bend those knees and use those gluteus! 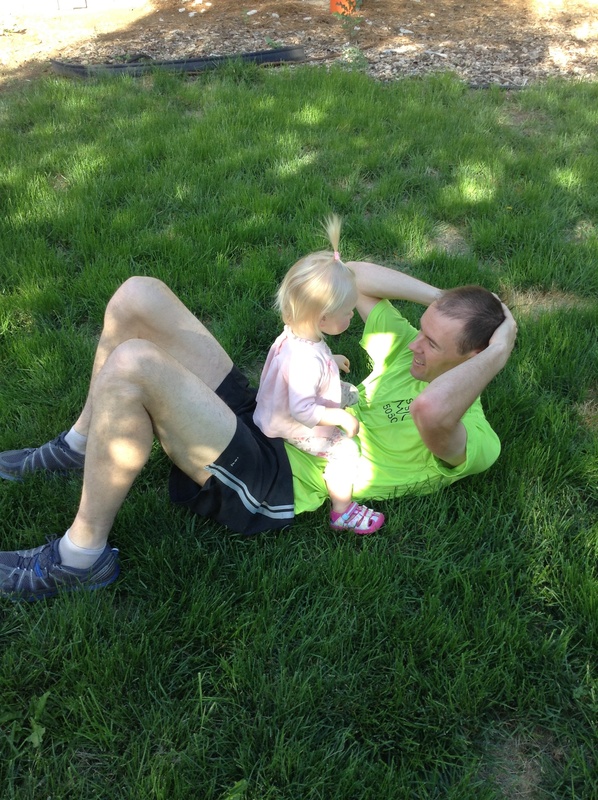 Seriously, a baby on my back is a great way to add some resistance to lunges and I throw a few sets into walks with the baby in the backpack. The funny looks from other dog walkers are just a plus…. Since my daughter has now been eating solid foods, my husband and I have been making regular trips to Whole Foods or the organic section at the grocery store to make sure she’s getting all the healthy fruits and veggies she can eat. I got sick of trying to shop with little Ms. Grabber reaching out to anything on the shelves (visions of her pulling down an entire display stand dance through my head every trip) and my husband really doesn’t like even going into Whole Foods, let alone browsing for vegetables. I have friends that have produce delivered, and that seemed like an easy solution to our little first world problem. We carefully made our selections, waited breathlessly and finally the special day came. I waited by the door, and that glorious white plastic box showed up magically on our doorstep, as if delivered by organic elves. In the container we found a beautiful head of butter lettuce, super leafy collard greens, Pluot (cross between a plum and apricot, very good by the way), gala apples, bananas, small sweet potatoes, white onion, oranges, a bag of carrots and a grapefruit. All in all we were impressed with our delivery, both quality and quantity. The only problem is the baby wasn’t impressed that there were only 2 bananas – she goes through that many “nanas” in a few minutes. She calmed down when I told her we could go back to the store for more. The other main perk is that we really get to expand our vegetable horizons with varieties that are hard to find or I never consider buying, I mean who has ever heard of a Pluot? Once the garden starts producing, we may change our delivery to every two weeks, which is easy to do by the way. All things considered, this seems like a really good way to get our vegetables. 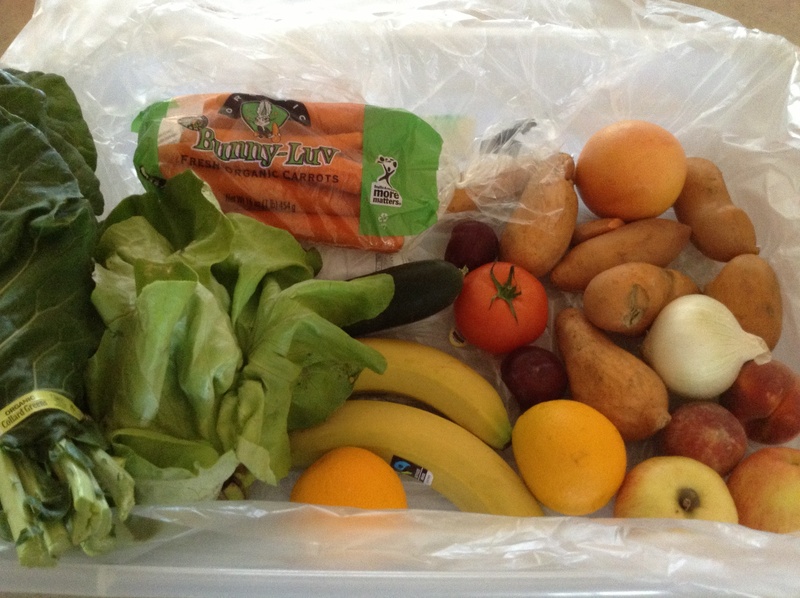 Have you ever considered getting produce delivered to your house?